The staircases in your home offer more than just a way of getting from one floor to another; they can completely transform your living space into one of luxury, comfort, or a unique work of art. They can serve as a stunning focal point in the foyer or wrap around the sides to form an elegant stairway to heaven. They can integrate glass sheets or wrought iron balusters with custom wood steps to showcase the beauty of different elements coming together as one. With so much potential for creativity, it’s no wonder why so many homeowners invest in custom hardwood stairs from Bailey Custom Woodworking when it comes time to remodel their Springfield home. From spiral staircases, curved stairs, and L-shaped stairs to straight stairs with a modern twist, here are some of our favorite wood staircase design ideas for you to consider for your next home improvement project! Spiral staircases are making a major comeback, perhaps due to the timeless elegance they bring to any style home. Yet what’s different about this new wave of spiral staircases is that many of them explore new stair designs using multiple elements like hardwood, stone, glass, and various metals. As with many things, creativity is the key to creating custom stairs that bring the rest of your living space together in a unique way, and custom spiral staircases offer endless possibilities for imagination. 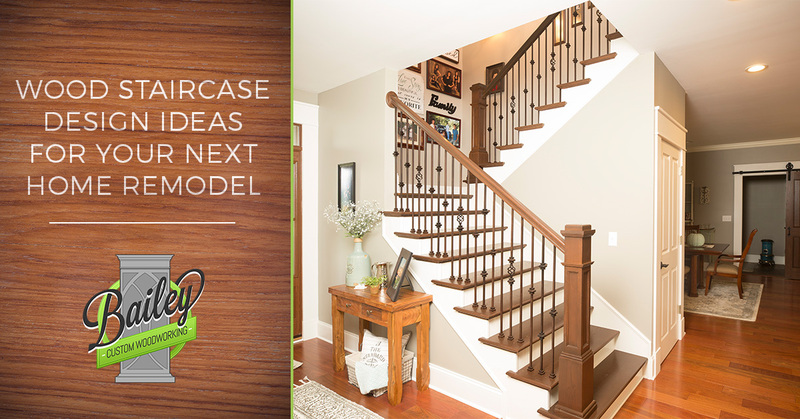 So sketch out the spiral staircase of your dreams and let our custom woodworkers bring it to life! Curved staircases offer a solution for homeowners who like the look and feel of spiral staircases but don’t want their new hardwood stairs placed in the middle of the room. Unlike metal or wooden spiral staircases, curved stairs integrate with the layout of the room by wrapping around the edges and accenting the parts that make it unique. Want your luxury staircase to ascend to the catwalk above the foyer? Sure thing. Does it need to curve over a doorway with multiple landings? Totally doable. The beauty of curved stairs is that they can be placed nearly anywhere, in any way. We’ve all seen them before, and many of us have them in our current homes. L-shaped stairs offer a convenient way to join two stories without taking up much room, making them a great option for homeowners who want to maximize their space. The great thing about L-shaped stairs is that you don’t have to sacrifice aesthetics for practicality; the banisters, balusters, and middle landing can be personalized with unique elements that bring out the beauty of your custom wood stairs. If you’re looking to save room with your new hardwood staircase but want something a little more complex than L-shaped stairs, you’ll love how U-shaped stairs can reshape your space. The main difference between L- and U-shaped stairs is the length of their landings and the direction of the second stairwell, with U-shaped stairs being parallel to each other rather than forming an L shape. This creates a fun new slanted ceiling space to play with, whether that means leaving the wooden stairs exposed underneath, covering it with drywall, or hanging a piece of wall art on it. In many cases, straight stairs integrate best with the layout of modern homes — but that doesn’t mean they have to be boring. Rather than going with the same carpeted stairs you had before your new home remodel, pick out a cozy carpet runner to roll down the middle or mix it up with painted risers that contrast with the color of your stained hardwood stairs. Choosing bold railing features is another great way to add to the uniqueness of straight stairs, as wrought iron balusters and bold wooden banisters can modernize nearly any style custom wood staircase. We hope that this blog post has given you some inspiration for your next home remodel and that you will choose Bailey Custom woodworking to bring your stair design ideas to life. As the leading custom woodworker in Springfield, IL, we’ve created dozens of one-of-a-kind hardwood staircases for local homeowners and we look forward to taking on your project. Contact us today for a project estimate!